Today is a first for me: a hotel review post. Matt and I love to travel and have been lucky enough to be able to visit some awesome places together, so I thought I would share some of our experiences here on my blog. So expect more posts including hotel reviews, travel tips and much more. My first review is for the Vdara Hotel and Spa, which is where we stayed during our honeymoon to Las Vegas. We stayed for 10 nights in July/August 2013 on a room only basis. We had a studio suite with a pool view. The hotel is located within CityCenter near Aria and The Cosmopolitan. It doesn’t have a casino, and is non-smoking too, so it felt like a little haven away from the hustle and bustle of the other hotels on the Strip. It was so quiet and peaceful, and the lobby smells like green figs, the most A.M.A.Z.I.N.G. smell ever! Despite being technically off-strip, the hotel is easily accessible with a walkway from the lobby through to the Bellagio and you can also catch a free monorail shuttle which stops at the Bellagio, Aria, Monte Carlo and the shops at Crystals. Our room (and indeed the hotel) was the nicest hotel we have stayed in. I feel like I should point out that Matt and I aren’t into expensive, high end luxury hotels by any means, but we do like to stay somewhere relatively nice and above all, clean. 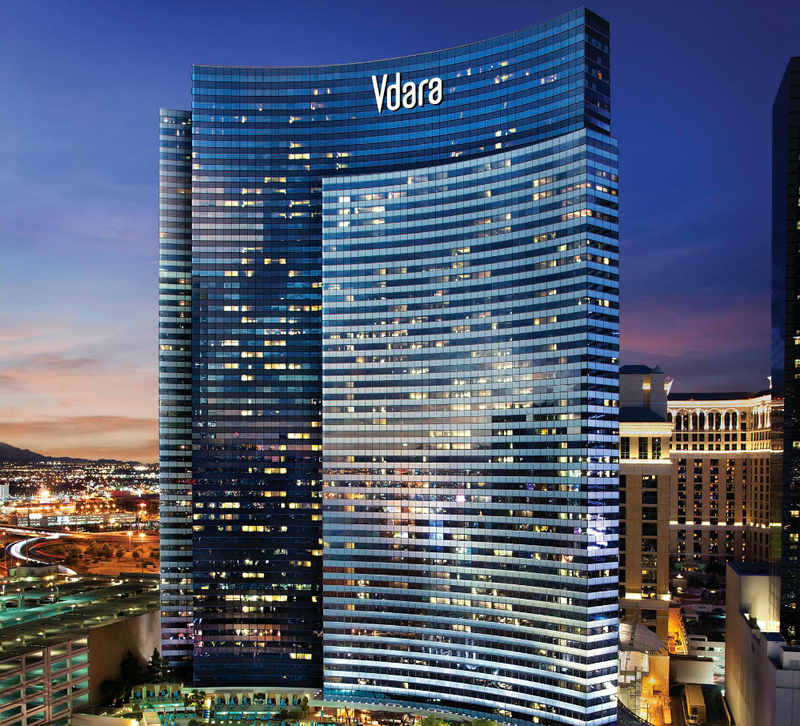 The Vdara Hotel and Spa fit the bill perfectly, and exceeded our expectations. Our room was spotlessly clean and well-maintained, and most days when we returned from our days exploring Vegas, it had been cleaned and tidied by the housekeeping staff. The Vice Versa Patio & Lounge bar is the hotel’s bar, located in the lobby area. Alongside a fancy cocktail menu, they also have a food menu with bar meals such as turkey sliders and fried mac & cheese bites. They also serve breakfast on Fridays, Saturdays and Sundays. 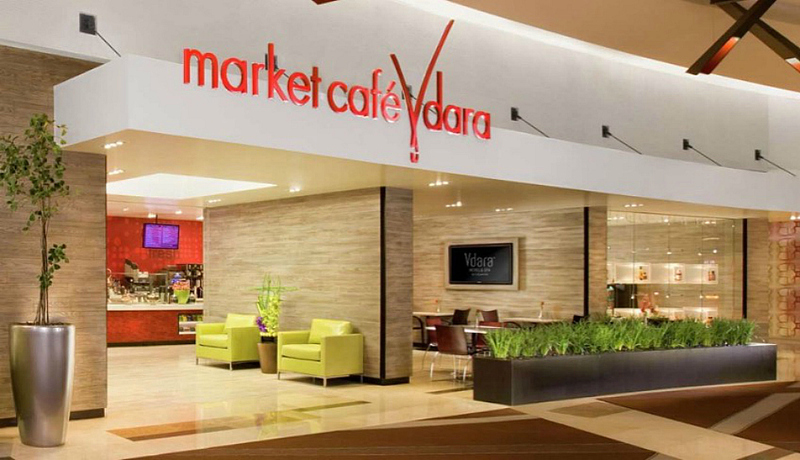 Alternatively, there is the Market Café Vdara which serves some delicious looking snacks and meals, and is the place to grab breakfast. There is also a ’boutique grocery store’ area within the café to buy food and drinks. A new addition is a Starbucks situated within the hotel itself, giving guests another option to grab a quick snack or drink. For a more formal restaurant, the Vdara’s sister hotel, Aria has a number of restaurants and can easily be accessed via the complimentary monorail. Finally, the hotel does provide room service or ‘in-suite dining’. We experienced it in the best possible way, as our beautiful friend Jodie and her husband arranged for us to have an in-room breakfast which was so, so wonderful. We got eggs benedict, mimosas, pastries and chocolate covered strawberries, all served to us by a super nice member of staff. It was such a lovely, generous gift which we thoroughly enjoyed! We booked 10 days as we really wanted to get a feel for Vegas, but also have enough time to relax around the pool. The heat was pretty stifling around the pool, but there were umbrellas for shade so it wasn’t too horrendous, although there was one day where I just couldn’t cope with the heat so I retreated to our air-conditioned room whilst Matt sizzled like a sausage out in the sun. The Pool & Lounge area was pretty nice, nothing spectacular scenery wise compared to some of the pools in other hotels, but a good amount of sunbeds, complimentary towels and a pool bar with friendly staff that sometimes gave out little virgin cocktail samples for guests to try which was nice. There are also private cabanas you can rent, and plunge pools in addition to the main pool. I did like that it wasn’t too busy and we didn’t have any trouble finding a couple of sunbeds when we wanted to use the pool. The hotel also has a spa and fitness centre (and smoothie bar) which we didn’t see or use, but you can find details of them both here. In all honesty, I think these resort fees are completely unreasonable and unnecessary. Upwards of $20 per night depending on which hotel you stay at, they are charging guests for things which many, many hotels provide as part of the room cost. Often these fees are NOT included in the prices quoted when booking online, so please read booking details very carefully and be aware that you will be charged these fees when you check out. At today’s prices, our 10 night stay would be an extra $442 which is around £335 – not a small amount if you hadn’t already budgeted for it. Extortionate resort fees aside, the Vdara Hotel and Spa was an excellent choice for our honeymoon stay. We would certainly not hesitate to stay there again, and would recommend it to everyone, except families with young children as the hotel has a much more adult vibe. Somewhere like The Excalibur or Circus Circus would be a better choice for a family stay. * All images my own or property of Vdara Hotel and Spa.